I replaced a 2007 BMW 335i with this after its age started to cause me more financial distress than I was able to deal with. I've tried to be objective but I do have a soft spot for BMW, particularly with regard to the driving experience. That aside, there's a good reason the G35, G37 and Q50 are so common. They're great cars. 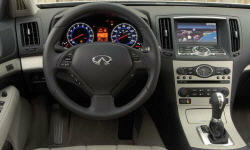 Why the 2013 Infiniti G? With AWD, this car feels unstoppable. The first three gears are short and it moves through them smoothly with serious authority. The engine makes decent midrange power while making a nice bellow. Above 4500 it really goes. I was surprised into laughter on the way home when I thought, "I wonder what this thing can do," and gave it the beans on the entrance ramp to the highway. The G37x has taller sidewalls than some of the other 2WD versions. It's very comfortable without feeling like a boat. This is a great car to drive every day. I like the seats in this car a lot. The bolsters feel well placed and keep you from moving around too much when cornering with enthusiasm, and they're comfortable to sit in overall. Visibility out of this car isn't bad. It's easy to back in with the mirrors, and the backup camera is a bonus. Oh, you can also see well out of it when looking forward, too! The driving controls are nice enough that I wish the car had a manual - the steering and shifter land right where they should for me. 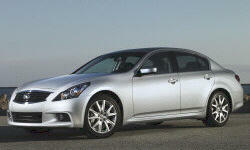 Why Not the 2013 Infiniti G? What the powertrain giveth, the fuel economy taketh away. Nissan's VQ engines just seem to be thirsty - if you commute in heavy traffic, especially for short trips, don't be surprised at 15.5-16 mpg tanks. I don't know what mostly-highway commuting would look like, but maybe 22-25 mpg depending on driving style. This car replaced an '07 BMW 335i that had 18" wheels and summer tires. That's a very different car, so take my comments with that in mind because it does bias me. You can feel this car's weight - it doesn't hide it well. The steering wheel doesn't have much feedback, and when you're in the rain it's difficult to tell when the front tires are starting to slip. It doesn't give a lot of confidence when coming into corners. The stereo in this car just doesn't sound that good. There doesn't seem to be much higher-frequency extension and there definitely isn't much down low. I think the lack of highs might contribute to it not sounding as clear as it should. The stereo's made by Bose; it has their active EQ built into the amplifier, which complicates upgrading the stereo. The controls for answering the phone are awkward. I feel like I have to fumble around with the 4-way buttons on the console to deal with the phone. That is about the only actual complaint I can level against the controls, though. I'm really thankful that Nissan put knobs for the A/C and volume on the console, as well as fairly large buttons for things like the climate control. The console also isn't overcrowded. This car isn't vault-quiet, but it makes noise in good ways. Wind noise is reasonable, and I think with good tires road noise is probably nice. The engine noise isn't muffled too much - it makes a sporty bark when it starts up and has a good, muscular tone even in normal driving. I spent about 3 months searching for the BMW's replacement. I had a high standard for the driving experience, but I also didn't want anything with major known issues to worry about. If you're looking for a rear-drive sedan that's comfortable and quiet, but also accelerates authoritatively without having to beat on it, and accelerates REALLY authoritatively if you do, this is one of the best cars I was able to find. Though not without shortcomings in some areas, these are really good, reliable cars that don't trade performance for it. The chassis feels nice; the engine is both silky smooth and powerful. The fuel economy's not great and neither is the stereo, but those are minor complaints.